Josephine C. Moore, Ph.D., OTR, FAOTA, DSc. Hon. (2) says "This is a must read for all therapists who work with infants and children." Dr. William Padula, O.D., FAAO, FNORA, says "This book should be in the library of all rehabilitation professionals." Christine A. Nelson, Ph.D., OTR, FAOTA, NDT Coordinator Instructor says "This is a work that is sorely needed in the therapy professions." This text discusses, explains, and relates various systems within the central nervous system, and establishes an understanding and dialogue about the dynamic interaction of the visual, vestibular, and somatosensory systems. Emphasis is placed on how sensorimotor systems interrelate, weight and re-weight, influence, modify, and cooperate in the development and active initiation of functional performance, beyond what might be usually considered in clinical practice. 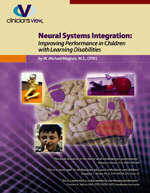 It is the goal and purpose of this text to understand the powerful interrelationships of sensorimotor systems and how they can be influenced clinically to improve efficiency and performance. Hopefully it will spark interest, discussion, and enthusiasm for the ultimate goal of all therapists, which is to improve the lives of the individuals they serve.